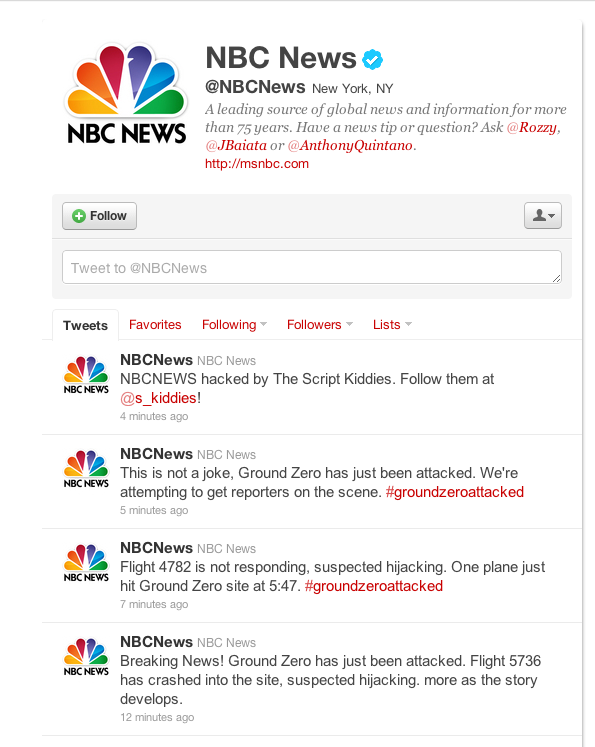 The Twitter account of NBC News has been compromised by a hacking group calling themselves the ‘script kiddies’ and has been Tweeting out false messages about a terrorist attack on Ground Zero. The Script Kiddies group is apparently sympathizing with hacking group Anonymous as the name appears to refer to the Department of Homeland Security calling Anonymous ‘just a bunch of script kiddies’ earlier this month. Updated with statements from NBC and Twitter below. 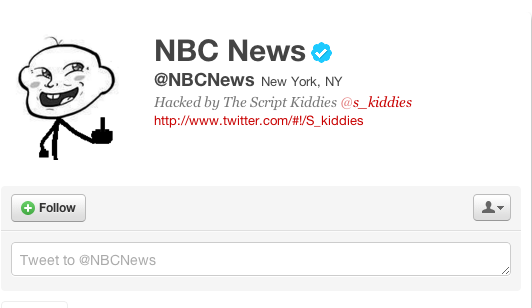 The group has just changed the NBC logo to a graphic and altered the ‘about’ section of the account as well. The about info links to a Twitter account that has been suspended. Twitter is apparently acting on the matter quickly as the NBC News Twitter account has also been suspended now. Twitter has responded as well by stating that they do not comment on individual accounts, but referred us to this post on the Twitter blog about account safety, implying that the hackers managed to gain access by obtaining the NBC account’s password, not by compromising Twitter’s servers.